21: Establish a national policy governance structure for monitoring and implementing the third national dementia strategy. The 2017-2020 strategy builds on the progress made since the introduction of the first and second strategies. The National Dementia Strategy 2013 - 2016 set out the work that the Scottish Government and its partners in NHS Scotland, local government and the voluntary and private sectors are planning to improve support, care and treatment for people with dementia, their families and carers. The Scottish Government's first strategy, published in 2010, focussed on improving the quality of dementia services through more timely diagnosis and on better care and treatment, particularly in hospital settings. 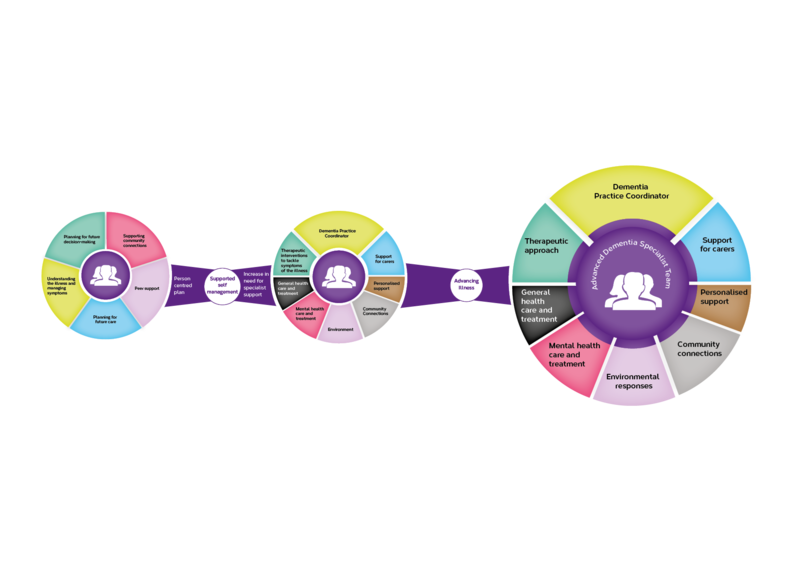 Developed by Alzheimer Scotland, the 8 Pillars Model of Community Support is designed to provide a coordinated approach to supporting people to remain at home for as long as possible. The framework sits within an overall model of which the 5 Pillars Model of Post Diagnostic Support is the first stage. The End of Life (Advanced Dementia Model) is the final stage of the overall model. The Scottish Government’s National Dementia Strategy 2013-16 piloted the 8 Pillars Model and the new National Strategy for 2017-20 also bases its commitments on care co-ordination in the community on the Model. An evaluation of the 8 Pillars Model, commissioned by the Scottish Government, was published in 2017. NHS Education for Scotland (NES) and the Scottish Social Services Council (SSSC) have developed Promoting Excellence: A framework for health and social services staff working with people with dementia, their families and carers. Designed to support delivery of the aspirations and actions outlined in the Scottish Government's first National Dementia Strategy, the framework details the knowledge and skills that health and social services staff should aspire to achieve in relation to the role they play in supporting people with a diagnosis of dementia, and their families and carers. They have created an accompanying learning resource, Promoting excellence in supporting people through a diagnosis of dementia, to help health and social services staff further develop their ability to support people with dementia and their families before, during and after receiving a diagnosis of dementia.